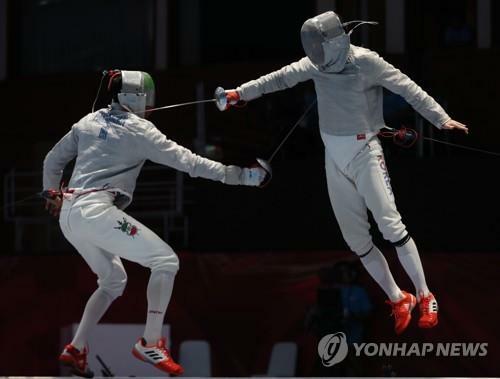 JAKARTA, Aug. 23 (Yonhap) — South Korea won its second straight Asian Games gold medal in the men’s team sabre fencing on Thursday. South Korea, world No. 1 and 2018 world champion, defeated Iran 45-32 in the gold medal match at Jakarta Convention Center (JCC) Cendrawasih Hall in Jakarta. The team of Gu Bon-gil, Oh Sang-uk, Kim Jung-hwan and Kim Jun-ho gave South Korea its fifth gold medal from the piste in Jakarta, with one more day of team competitions remaining. Gu, the individual champion from Monday, is the first double gold medalist for South Korea in Jakarta. Gu also pulled off the individual-team double for the second consecutive Asian Games. Of the current members, Gu and Kim Jung-hwan were on the 2014 gold medal team, too. In team events, each match is made up of nine individual bouts fought by three fencers. Each member of a team faces each member of the other team once. A head-to-head bout lasts three minutes or until one team’s score reaches a multiple of five. The objective is to get to 45 points first or to have more points than the other team by the end of the ninth bout. Facing Mojtaba Abedini to lead off the match, Oh won the bout 5-1 to set the tone. South Korea built a 25-18 lead through five bouts, seemingly in cruise control. But Iran, world No. 5, wouldn’t go away easily. Ali Pakdaman gave Kim Jun-ho all he could handle and beat him 8-5, cutting the deficit to 30-26. But Gu, who had looked a tad shaky in his earlier matches, held off Mohammad Rahbarikoyakhi 5-1 to put South Korea up 35-27. Kim Jung-hwan stepped in for Kim Jun-ho, who had taken an errant punch to the face in an earlier bout. And the 34-year-old vet, competing in his last Asian Games, came through with a 5-3 win over Abedini. It set the stage for Oh to finish what he started. With a comfortable 40-30 lead, Oh hardly broke a sweat in closing out Pakdaman 5-2, wrapping up a 45-32 win.